My kitten is small. Her weight is 1.3 kg. But I think when I get Advocate she will be around 2kg. can I use it for her? If I can't use it for her Can you recommend something else? 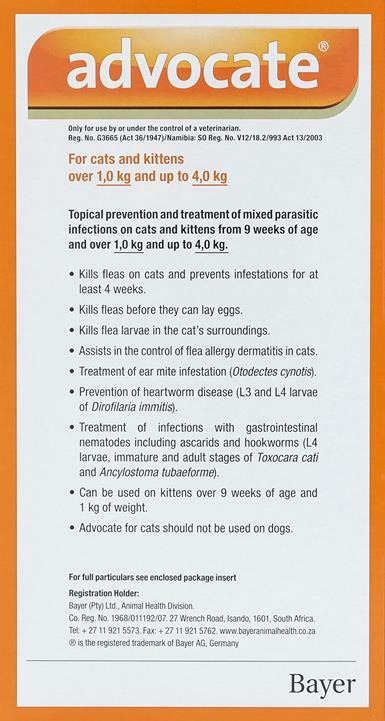 Advocate / Advantage Multi can be used on cats from 9 weeks of age and over 1kg in weight. So you can use it safely on your kitten. I can see Advantage Purple and Green products. And there are Advantage Multi and just Advantage. What are they? Advantage green is for small dogs and cats, while Advantage Purple is for cats over 4kg. Advantage treat fleas only while Advantage Multi treats other parasites. Both Advantage and Advantage Multi are from Bayer. Is there a chewable tablet for cats that can be given with this? The reason I am asking is because the option is there for dogs so was hoping the option would be there for cats too. Different products has different ingredients, therefore they can be used together. However you should get advised from your vet before using any medication. The active ingredients in Advantage Multi are imidacloprid and moxidectin. You can switch from Revolution. How often should I apply it . For protection you can apply once a month. If you have any outbreaks please speak to your vet.